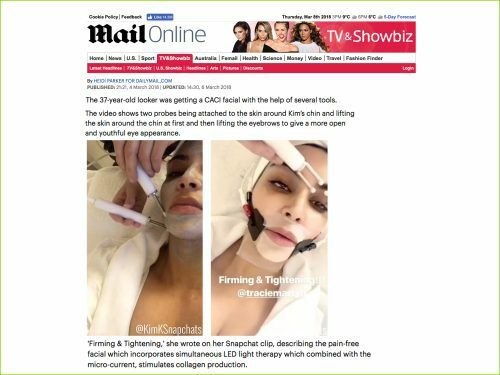 First Madonna, and now Kim Kardashian has revealed that she is a fan of the famous CACI technology; Microcurrent. The TV star is now having the non-invasive procedure to keep her skin looking lifted and toned. The social media posts were picked up by mainstream media including the Mail Online and Hello! Kim Kardashian joins the growing list of international celebrity fans, Jennifer Lopez and Jennifer Aniston that love CACI. CACI Microcurrent stimulation delivers tiny electrical impulses that mirror the body’s own natural bio electrical field. In most cases, treatment is virtually sub-sensory, with just a slight electrical tingling sensation. True microcurrent uses a current with an intensity of less than one millionth of an amp (< 1mA) and because of it’s low intensity it does not cause a physical or visual contraction of the muscle, instead, microcurrent stimulation works by a process called muscle re-education.